My favorite chicken noodle soup is Panera's low-fat chicken noodle. So I decided to go on an internet scavenger hunt to find a recipe. I found one and after some tweaking it was a bowl of just delightful Chicken Noodle Goodness...not exactly like my loverly Panera's, but close enough. In a pot combine stock, veggies and spices (except parsley). Bring to a boil and cook 7-10 minutes, until veggies are tender. Add chicken and cook for another 10 minutes. Then stir in parsley. 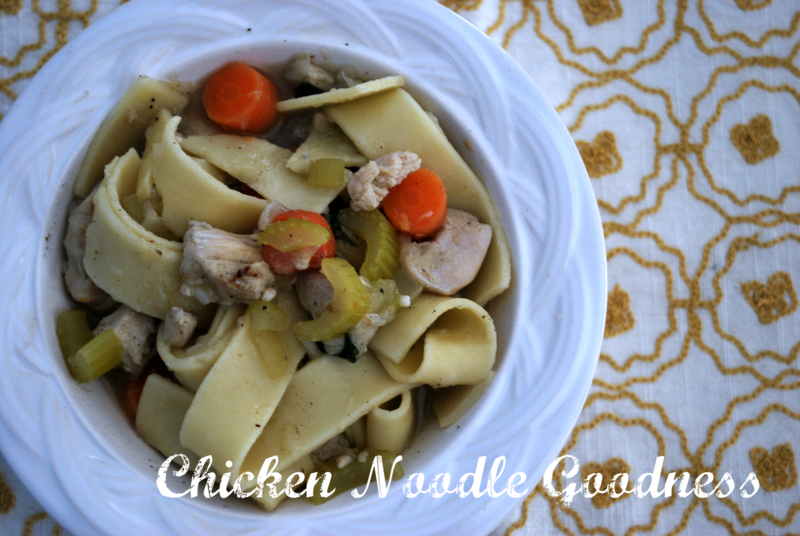 While chicken is cooking, cook noodles as per package directions, drain and add to soup. Looks yummy! I love those chunky noodles. Yum. I want a bowl!